I love when I pick up a cookbook and learn about new ingredients. One such ingredient that has recently been added to my diet is labne (sometimes written labneh) cheese, which is a spreadable cheese that is made from kefir. 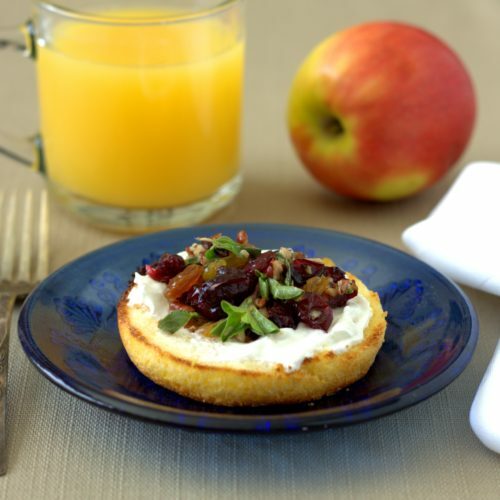 The consistency is similar to softened cream cheese, with a bit more tartness like that of plain Greek yogurt. I enjoy it both for breakfast and on sandwiches, so make sure you experiment to find your favorite use. 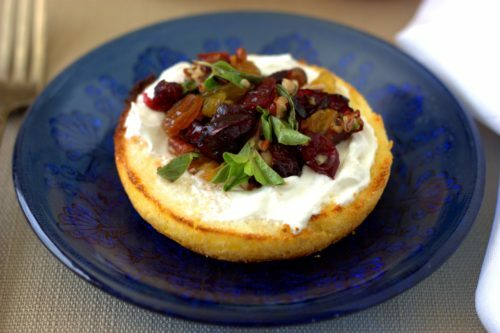 Today I am serving an open face breakfast sandwich (or tartine) for a pretty display of both the labne and the colorful raisin topping. Adding a bit of fresh oregano cuts the sweetness of the raisins and adds a unique depth to the dish. The tartine is quick to pull together, yet looks amazing when plated, so don’t be afraid to serve this for your next brunch. In a medium sized bowl, mix together the raisins, cranberries, pecans, oregano, lime juice, and honey. Split and toast the English muffins, then spread 1 tablespoon of labne on the cut side of each muffin. Top with even amounts of the raisin mixture and serve. Makes four servings.